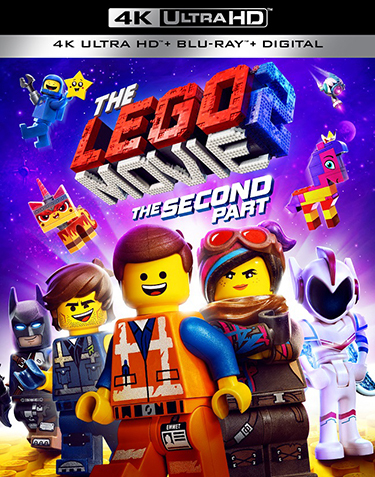 It’s time to go where no brick has gone before when “The LEGO Movie 2: The Second Part” arrives on 4K UHD Combo Pack, Blu-ray Combo Pack, DVD Special Edition and Digital. The much-anticipated sequel to the critically acclaimed, global box office phenomenon that started it all, “The LEGO Movie 2: The Second Part” reunites the heroes of Bricksburg in an all new action-packed adventure to save their beloved city. Reprising their starring roles from the first film are Chris Pratt (“Guardians of the Galaxy,” “Jurassic World”) as Emmet; Elizabeth Banks (“The Hunger Games” movies, “Love & Mercy”) as Lucy, aka Wyldstyle; Will Arnett (“The LEGO Batman Movies,” TV’s “Arrested Development”) as LEGO Batman; Alison Brie (TV’s “GLOW,” TV’s “Community”) as Unikitty; Nick Offerman (“Fargo,” TV’s “Parks and Recreation”) as MetalBeard; and Charlie Day (the “Horrible Bosses” movies, TV’s “It’s Always Sunny in Philadephia”) as Benny. They are joined by Tiffany Haddish (“Girls Trip,” “Keanu”) and Stephanie Beatriz (“Short Term 12,” TV’s “Brooklyn Nine-Nine”) as new characters Queen Watevra Wa’Nabi and General Mayhem, respectively, and Maya Rudolph (“Bridesmaids,” TV’s “Big Mouth”), as Mom. “The LEGO Movie 2: The Second Part” was directed by Mike Mitchell (“Shrek Ever After,” “Trolls,” “Sky High”) and produced by Dan Lin, Phil Lord, Christopher Miller and Roy Lee, the team behind the LEGO film franchise since “The LEGO Movie,” and Jinko Gotoh. The screenplay was written by Lord and Miller, the Oscar-winning producers of “Spider-Man: Into the Spider-Verse,” from a story by Lord, Miller and Matthew Fogel, based on LEGO Construction Toys. Trisha Gum was the animation director. Warner Bros. Pictures and Warner Animation Group present, in association with LEGO System A/S, a Rideback/Lord Miller/Vertigo Entertainment Production, “The LEGO Movie 2: The Second Part.” The film will be distributed worldwide by Warner Bros. Pictures, a Warner Bros. Entertainment Company. The 4K Ultra HD Blu-ray disc of “The LEGO® Movie 2: The Second Part” will feature a Dolby Atmos soundtrack remixed specifically for the home theater environment to place and move audio anywhere in the room, including overhead. To experience Dolby Atmos at home, a Dolby Atmos enabled AV receiver and additional speakers are required, or a Dolby Atmos enabled sound bar. Dolby Atmos soundtracks are also fully backward compatible with traditional audio configurations and legacy home entertainment equipment. “The LEGO Movie 2: The Second Part” will also be available on Movies Anywhere. Using the free Movies Anywhere app and website, consumers can access all their eligible movies by connecting their Movies Anywhere account with their participating digital retailer accounts.